Abbas needed all five games to end the run of qualifier Julianne Courtice, who finally ran out of energy in the fifth, while Sharpes put in an impressive performance to beat Christophe Andre in straight games. It's Semi-finals day here in London Open Squash Championship at Cumberland LTC. The First match started off in ladies where top seed Nada Abbas from Egypt beat Anna Serme from Czech republic in straight games. Nada as usual started of with fast and furious pace and let Anna handle her self in the game and beat her 11/8, 11/5, 11/6 3-0 in 29 mins and qualify to the final. 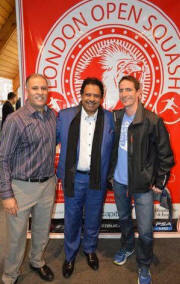 Second match was played between smooth and quick runner from Malaysia Mohd Syafiq Kamal and French man Christophe Andre. Both Player looked very sharped in first few rallies but it looked like Kamal's was tired and wasn't his day where he made so many errors in all 3 games and he lost 3-0 in 28 mins. But at 10-5 match ball to Andre twist his ankle where he appealed for a stroke which he did get it. 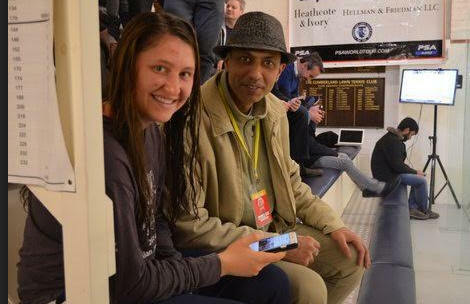 But when i spoke to asked Andre about his foot he replied with a smile that he will be ok for tomorrow's final. The third match was played between a young English girl who came from Qualifying round to the Final After Beating Rachael Chadwick 3-0. It looked like Chadwick will win the first game but Julianne Courtice fought very well and clinch a very tight game 11/9. in the second and third game Julianne came in sharply with different pace and technique and the match 3-0 in 33 mins where she is playing a young Egyptian Nada Abbas at 16:00 hrs. will she win the final and make a history in London Open 2016? Its still a question mark for all of us. The last match was between two young English player Charles Sharpes vs Tom Ford. In the first game both played some tourmandes shots with lots of drops and lobs and Cross court nicks with paces and long rallies but Sharpes played a sharp shots in the end and won the first game 11/8 in 19 mins. In the second game at 2-0 to Sharpes, Tom broke his racket String and went off the court to get an other racket but he returned back empty handed and ask the audience to provide him a racket to play his match. It was a funny scene at the time when Sharpes said he also got the last racket. HA HA HA, anyways they carried on with t game but Tom couldn't control the ball with a different racket and the game 11/3. In the third again he changed a racket which suits his hand and played a great game with some fantastic backhand drops and cross court nicks and won the 11/7. But again Sharpes knew what he has to do and he did with pace and long rallies tried not to go for winners where Tom counldnt kept his patience and lost 11/7 3-1. Now Charles playing his First London Open Final in 4 time participant in this tournament and looking for a crown where he is playing a giant man Christhope Andre from France at 16:45 hrs. There is going to be a doubles Exhibition match before the finals at 15:30 hrs. Charles Sharpes make his place into the semi-final after a lucky escape in Quarterfinal where a Qualifier Julianne Courtice made her place into the semi' at London Open. 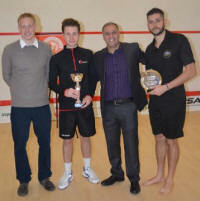 Match of the day was between Charles Sharpes from England vs a Qualifier Adam Auckland also from England. 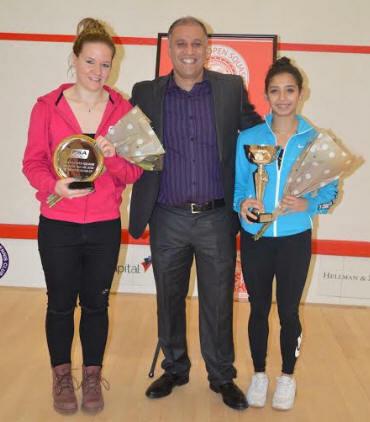 Both Played a superb game of Squash. Charles Lost the First game 11/4 to Auckland but he did well in the second game and won it 11/3 1-1. In the Third Auckland had some long rallies but his impressive nicks and drops made him win the game 11/6 and went 2 games to 1. Fourth game looked like Adam will win the match with 4 Match ball but Sharpes didn't wanted to give up and get a match out of Adam's hand and won the game 17/15 in 23 mins and equal the game 2-2. In the fifth Adam tried his best but his legs couldn't help him to win that game and he lost 11/6 in 82 mins. 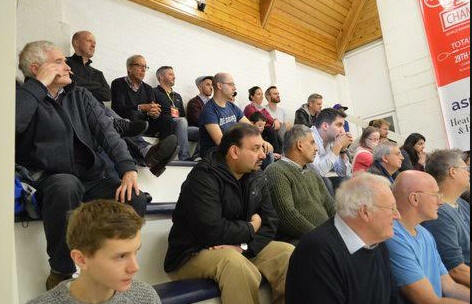 It was a packed day at Cumberland squash club for the Quaterfinal Men and Women matches in London Open Squash Championship 2016. The Second matchewas played between Elise Lazarus a 16 years old from England vs Anna Serme from Czech. Elise started well with high pace with some tight lenths and cross cross court and won the first game 11/6. In the second Anna came back strong and move Elise around the court and won it quite comfortably 11/3. In the third Elise bounce back very well but couldn't keep the patience at the end where she went for winners but all went to the tin and lost a close game 11/9 and went down 2-1. Fourth game Elise Tried her very best but she got nothing left in tang and lost the game 11/6 and match 3-1 in 40 mins. Third match was played between Israr Ahmad from Pakistan vs Tom Ford from England in which Tom was too strong for Israr and won his match 3-0. Fourth match was ladies which was played between Rachael Chadwick from England vs qualifier Celine Walser from Switzerland. First game Chadwick won 11/1 but in the second Celine gave Chadwick a hard time but Celine lost 14/12 and lost the third game 11/3 3-0. Fifth match was played between a giant man Christhope Andre from France and Peter Creed from wales. In the first game Peter and Christhope were brutuling the rallies after rlalies where Andre clinch the game with a very tight call 15/13. In the second and Third Andre looked very strong and beat Creed 3-0. The Sixth match played by ladies between Nada Abbas a young Egyptian played with Tinne Gilis from Beligium. Nada Kicked off very well and won the first game 11/9. In the second Tinnie played very well with some strong rallies and didnt let Nada a chance to player her strokes and make it 1-1. In the third they had some nail bitting ralies with so many lets and arguments with reff but Nada kept her nerve calm and won the game 11/9 and 2-1. Fourth game Nada Competely changed her game and didn't give Tinne a chance to stay on T and won the game and match 11/5 3-1. 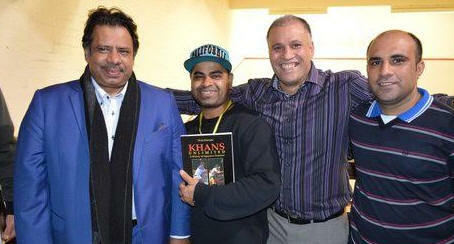 Seventh match was played between Asim Khan from Pakistan vs Mohd Safyiq Kamal from Malaysia. Asim played very well but unfortunately he coudn't do his 100% due to hepatitus 3 weeks ago back home where he didn't train much for this event and he lost 3-0. Final Match was played between a qualifier Julianne Courtice from England vs an other qualifier Haley Mandez from USA. Haley started of very well and won the first two games 11/3, 12/10. But Julianne came back pretty strong and picked up some amazing drops played by Haley where she couldn't stop Julianne from picking them up in every relies. Julianne won the next three game 11/4, 11/5, 11/5 after 2-0 down and win the match 3-2 in 63 mins and spot her place into the semi where is going to play Rachael Chadwick from England. 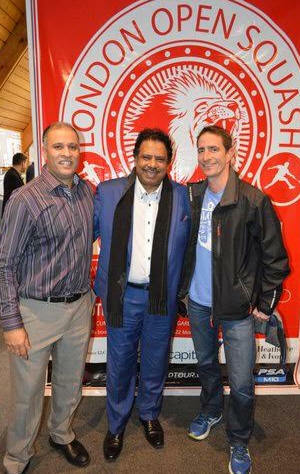 The best of all at London Open when the king of Squash legend Jahangir khan walked in to the club with Ross Norman and watched a bit of a game between Charles and Adam for a while but then they got busy with their book singing. Main round started with the Upset of a second seed Mahesh Mangaonkar which was beaten by an unseeded from Malaysia Mohd Syafiq Kamal. Mahesh had a good start with 11-6 but Syafiq came back strong in the second game and won it with close call 14-12. Mahesh changed his game in the third and won the game with an other close one 12-10. But Syafiq didn't let it go and won the next two games 11-8, 11-6, 3-2 in 66 Mins and upset in the tournament. Other matches went really well in Men's and Women's. But their Was an other great match been watched by the crowed between ex world number 2 from England Peter Marshall vs Young fast and fit Charles sharpes from England to where Peter won the first game 11-8. Marshall the old warrior used his experience with Charles in the fourth with some great drops and nicks and pick ups and won the game 11-9 and went 2-2 in games. In the fifth Marshall got nothing left in the tang and Charles won the fifth game quite easily 11-4 and won the match 3-2 in 79 mins. Ex world number 2 Peter Marshall qualified for first round of London open squash championship after playing 17 years on a professional circuit. First he beat the top seed Benjamin Aubert from France 3-2 the big upset and then he beat the tall man Phill Nightingale 3-0. Tomorrow he is playing the top seed Charles Sharps the young English player at 20:00 hrs. 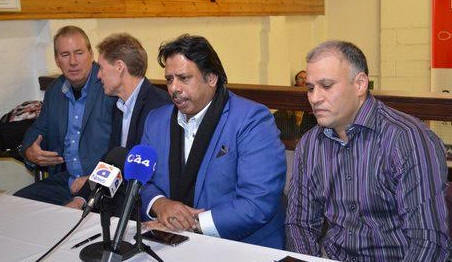 Peter said ''he is feeling a bit tired but he will give a hard time to his opponent''. Other then that in men's last qualifying round Miles Jenkins, Adam Auckland and Micheal Harris all from England has qualified for the first round. 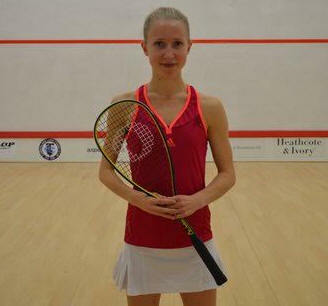 In the women's Elise Lazarus from England beat the top seed Kace Bartley 3-0. Where Julianne Courtice, Haley Mandez from Usa and Celine Walser from England has qualified for the first round. 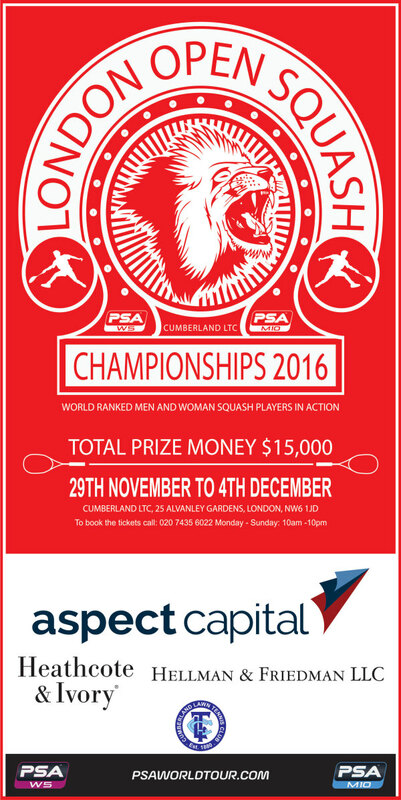 The London open kick off today with some amazing matches in Men and Women here at Cumberland squash club. The first match played between Miles Jenkins from England vs Jamie Wild the local player of the club. Jamie tried his best but Miles was quite strong and won the match 3-0. Second match was between Abdul Hadi an other local young 14 years old son of Zubair Khan the tournament director, he tried his best but Julian was way better them him and give him a good lesson on court and 3-0. Third match was Bradley Master vs Obaid Safi the local British Amateur champion where Bradley went 2-0 up but Obaid was force to pull out in the third due to back injury. Fourth match Adam Auckland start very well with 11/0 first game vs Gary Nisbet. In the second game Gary came back first 5 points quite strong but couldnt keep the pace of Adam and lost 3-0. Fifth match played between Simon White the local player vs Phill Nightingale where Phill won his match quite confidently 3-0. The sixth was between David Haley and Chris Pieper, this match went quite well where both players went for shots and some long ralies and all 3 games went close to tie brake where David Haley clinch the match 3-0. Upset of the tournament qualifying round where former world number two Peter Marshall beat the top seed Benjamin Aubert after a thrilling match which went for 75 mins. their were to many arguments went on between both players and reff over few decisions. But Peter fought so well till the end and won the match 3-2. 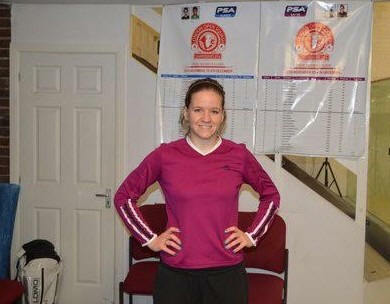 There were some Great matches played in women’s in which Lucy Turmel, Julianne Courtice, Julie Rosignol, Alice Green, Georgia Adderley and Elise Lazaurus all won their matches and qualified for the next qualifying round.